Zip! Just like that, Christmas is over. I hope you and yours had wonderful, cozy, and safe celebrations. Our travel (just local) worked out just right with the weather. Santa managed to make it to our house during the worst of the snow on Christmas Eve, so we had a good time opening presents and drinking coffee while the snow piled up. Brent didn't even bother to blow the driveway until about 3 pm. Now THAT'S a holiday! Having both our girls for their first Christmas together was magical, and all I really needed to have a perfect holiday. Emily Bea has just learned to battle-crawl in the forward direction (previously only went backwards, so frustrating) and she became very fast during Christmas. Every present that was opened soon had little Mimi frantically speed-dragging herself over to examine it. The girls got lots of wonderful gifts. 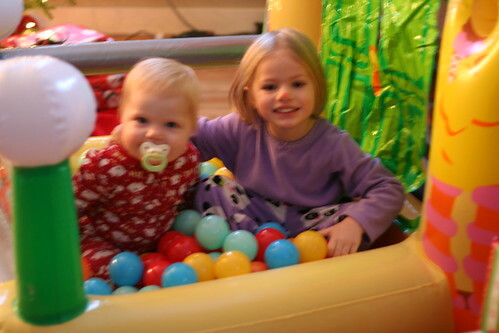 This ball pit was especially exciting! 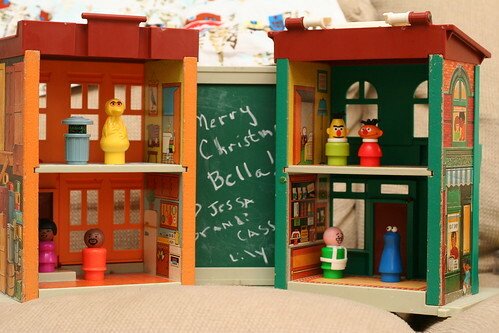 I got an amazing surprise when Bella opened her gift from Aunt Sally's family... the vintage Sesame Street set I had so persistently tried to get off ebay!! NO WAY! Now I get to have fun seeing if I can get good deals on all the accessories for it that are on ebay. I do like a good cyber-shopping challenge! Due to all of my pneumonia drama*, a few things slid by this year. Like baking. Didn't get any of that done. (Although we did make a gingerbread house. That counts, right?) We didn't celebrate St. Lucia day. My aunt and uncle in North Carolina didn't get their usual box of goodies. I didn't send a Christmas card (although I made one for you blog readers!). I contributed nothing to both family dinners we went to. And in fact totally forgot about our Christmas dinner. (Luckily I found some old filet mignon in the freezer!) The blog and my etsy shop had to take a hiatus. And, perhaps the lowest point of the season, I missed Bella's holiday show at preschool. But looking at the bright side, I finished my shopping, wrapping, and gift-making in time. Our house was decorated. We got a picture with Santa (adorable!) and celebrated St. Nick day (remembered at the last minute). So not all bad. Quite nice, actually. I wouldn't want to do it this way every year, but it's nice to know some hallowed traditions can be left for another year, and the holiday still feels special. Even Christmas Lite is still Christmas, and I am so thankful to have such wonderful families and to be able to be together with them. *As for my pneumonia, I got the best gift I could have asked for in the form of new antibiotics that work. Merry Christmas to me! I had pneumonia since mid-September and in early December was referred to a pulmonologist, who did a bronchoscopy and decided I must have drug-resistant pneumonia. This was great news (14 days of antibiotics and I'm cured), and I am so excited that the new antibiotics are actually helping (after just one week even). Hooray for modern medicine! I was even out sledding twice this weekend! YEEHAW!